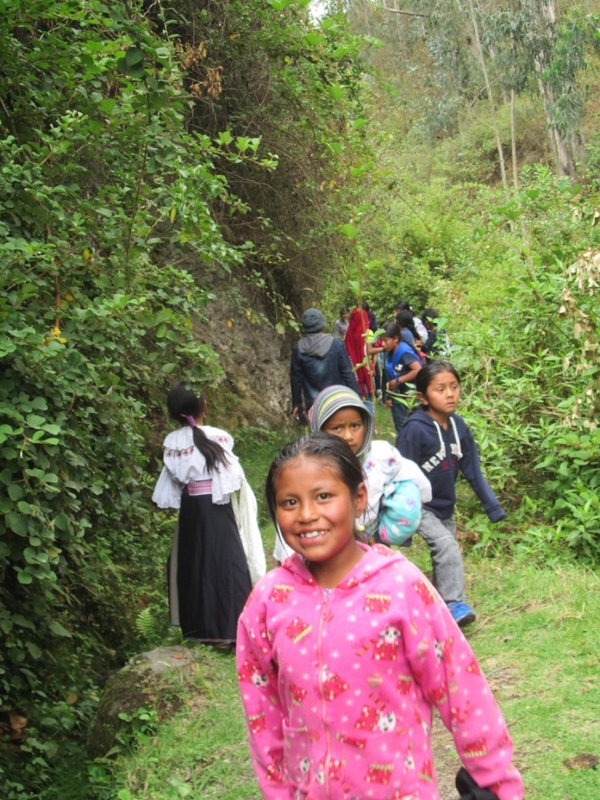 We were called (drawn) to serve in Ecuador through volunteering for FEDICE. That’s because we loved their philosophy of “helping people help themselves”. However, we often have opportunities to serve “outside” of FEDICE if we just keep our eyes, ears, and hearts open. Examples may be taking local people to touristic places they’ve never had a chance to visit, providing sweets for the Christmas parties at the preschools where I teach, or mentoring children. Recently, another unique opportunity to serve presented itself. A small group of adults were having Sunday devotionals together at our house. One member expressed concern about the youth in his community, both where he lives and the community where he worships. The young folks are restless, ungrounded in faith, wanting more. He said they would turn to alcohol and drugs if they had money. His heart aches for them. The small group talked about ways to attract them to church. He leads a small youth group at his church. They want to see more of the world. We hit upon a very small solution for beginning to attract more youth to his group. Let’s do some really fun things like going on an excursion. Let them choose the destination from a short list of possible excursions to be started from the church. After all, we have a 12 passenger van and I act like a taxista half the time anyway. If they don’t go too far, I could make two trips. (I may not be part of the group, but I don’t mind helping). That began the plan. 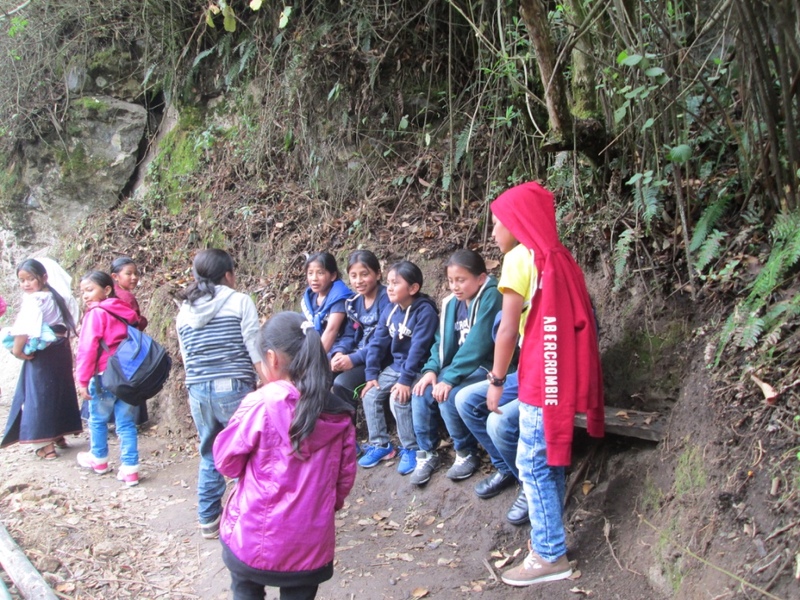 The leader talked to his group and they wanted to go to Peguche Falls, a half mile walk from our house. The youths chose a Sunday, the day after our fun Halloween party. 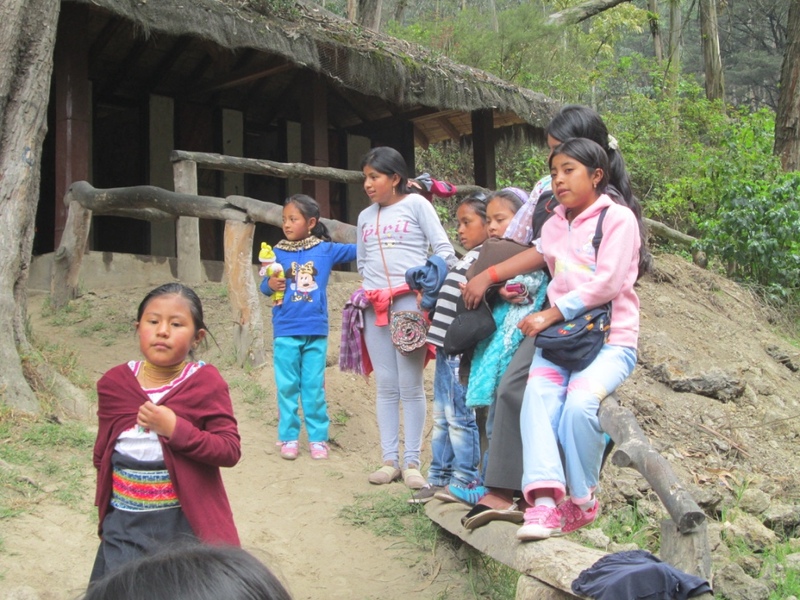 When the older elementary group heard about the excursion, they wished to participate as well. After all was sorted out with the pastor, the plan was for me to make two trips from the church to our house transporting both groups. Then the group would walk over to the falls along the river (which is a whole lot more scenic than walking in through all the vendor tiendas, the way the tourists go). I was to drive to the community twice and the leader would carry those who didn’t fit into my van in his pickup. Then, we would walk over to the falls together. The beginning of the plan worked pretty well. The older youth swarmed around the van when I arrived at the church. I was hoping no one got hit when I needed to backup. The kids were so excited, I had a full van of the older youth in no time. They were all asked to vacate to let the younger group go first. It may have been a disappointment for them, but they complied. When I returned for the second group my car was mobbed with eager, excited children again. We got everyone over to our house in no time. But where was our leader? After waiting for 10 minutes, I gave him a call. He was over at the falls parking lot and I had around 30 children and 2 adults at our house. A little English-Spanish miscommunication there. Not the first time. After he arrived, we walked over to the falls along the river. You may have noticed that I did not say that we walked “together”. The kids took off even if they weren’t sure exactly where we were going. I thought we were heading to the picnic grounds, that there were a group of other adults fixing a lunch. But that was not the case. We all eventually found each other at the swimming pool. 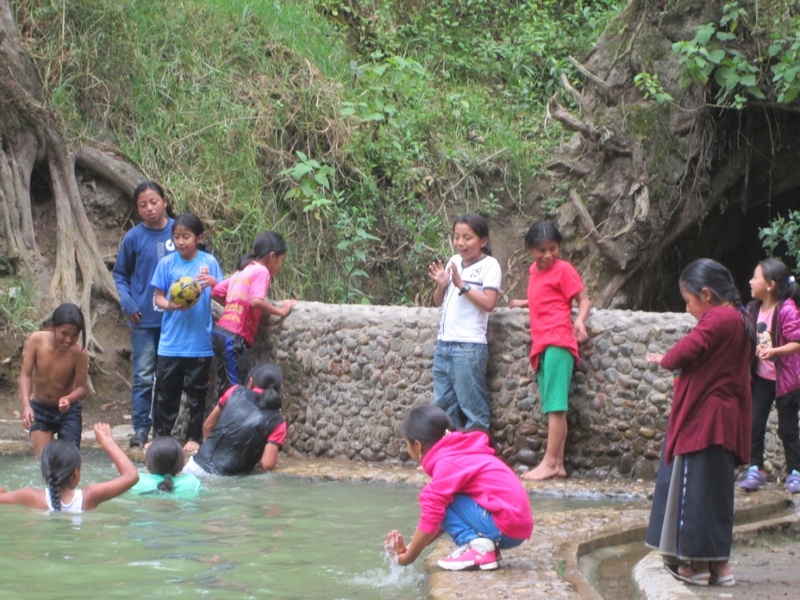 The water of Peguche Falls is considered sacred by indigenous peoples and it is not unusual for individuals to get into the small river below the falls. 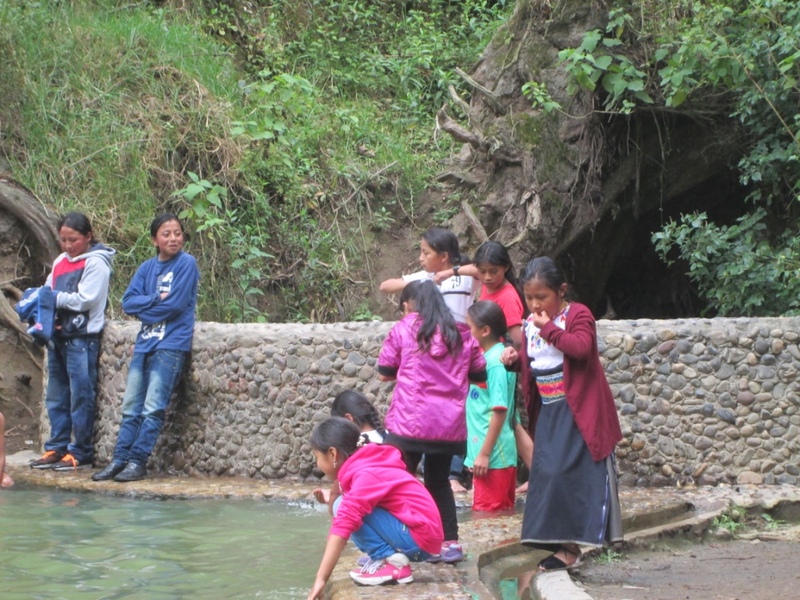 In fact, the local community has made two swimming-like pools filled with water that comes from springs near the river. A few of the older children swam while the others milled around. I believe everyone was getting hungry by this time. Still, there was no mention of food. About this time, our leader led some of the children away from the water. The rest of us really were not sure what was going on. We decided to follow this first group, or find this first group because, by this time, they were out of sight. We found him in the camping area. One of the other adults decided to take matters into her own hands. The children were gathered together where they all sat down on a log near the entrance to the preserve, not too far from the camping area. Several large bottles of cola were purchased as were a couple of packs of crackers. Two plastic cups filled with cola were passed along the line and each child drank a cup of cola and were given three crackers. Afterwards, we all walked back to the house and I transported a very, very full car of children back to the church while our leader took everyone else in the back of his pickup truck. The female leader and I decided that on the next excursion we would do the organizing. Maybe we would include expectations of staying together, of communicating the plan, of sharing a prayer of thanksgiving together, and of bringing food and drink. We knew that the first excursion was a great learning experience, even if we felt that it could be improved upon, substantially. But, improved upon or not, I pray that this small step, as well as subsequent steps, will have the desired effect of bringing youth closer to God. You touch my heart with your amazing energies and love of the peoples and youth around you. You are my model for how to share "resources" and be "alive". What a great story, and how well you show the light of Christ wherever you go. I think your organizational skills are much better, and I look forward to hearing about the next outing.